NARRATIVE: O May 22nd at 4:00 pm the City of Spokane Fire Department responded to 161South Adams for a reported building fire. Upon arrival it was reported that smoke was coming from the roof of the 4 story Borning building. The fire was confined to a stack of lumber on the roof next to an elevator house. .The fire attack lead was lowered from the roof to an engine and the fire was quickly extinguished. Additional leads were advanced from the street level to the 2nd and 3rd floors. The Building is under renovation and will be low income housing when completed. Damage was confined to the material on the roof. The cause was determined to be a pinched electrical cord. 30 firefighters and 2 command personnel responded to this incident. No injuries were reported. DAMAGE EXTENT: Stack of Lumber on roof. 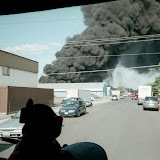 NARRATIVE: On 5/22/07 at 8:20 A.M. the Spokane Fire Department sent 3 engine companies, one pumper ladder company, one ladder company and two battalion chiefs to a fire inside the Safeway warehouse located at 5707 N. Freya. The first in fire crew discovered a fire in the kitchen that was mostly extinguished by a sprinkler head that had activated. Crews examined an exhaust fan that was nearby for any signs of fire extension and found none. There were a total of 19 firefighters that responded on this fire but most crews were turned back quickly as the fire was kept small by the operating sprinkler system. The fire was caused by someone who had set a cardboard box full of paper towels on top of the stove in the kitchen. A burner on the stove was in the "On" position. It is not clear at this time why this burner had been activated and the situation is still under investigation. Fire damage was kept to a minimum and the business will continue to operate. Some minor water damage did occur from the sprinkler. Fire crews remained on scene for approximately one hour afterward, to assist with water and debris cleanup. PROBABLE CAUSE: Improperly placed combustibles on top of a heating element. DAMAGE EXTENT: Some minor damage was sustained to the ceiling above the stove from the fire. There was also some minor water damage to contents from the activated sprinkler head. "Our negotiations wish list polling site is now open. Go to www.local29.org. Go to the Negotiations section under the Member Resources. All Local 29 members choose 5 of the wish list items. Prevention and Dispatch choose 1 in your wish list section in addition to your other 5 choices. BE SURE TO TYPE IN YOUR FULL NAME IN THE BOX AT THE BOTTOM OF THE FORM, THEN SUBMIT. We will count these votes on May 29th and post the results to the web site. Please vote as soon as possible and if you know someone that is off, please let them know to vote."